I've hit my first goal! My weight is back under 200lbs and I'm wearing a special polish to celebrate. Picture Polish Majesty was very kindly sent to me by MakeupAlley member waterqween when I'd mentioned not knowing if I wanted it or Ninja Polish Mystic Glacier as my reward for this goal. Thanks to her I can have both...if Ninja Polish ever restocks Mystic Glacier... If I ever do get my hands on it, I might wait until I've hit another intermediate goal before letting myself wear it. Maybe shrinking back down into my size 14 jeans. I'm closing in on that one too. The 16's are getting a bit loose. I was in 18's when I started writing this series. I'm feeling so much better over the past few weeks. I think my thyroid medication levels are right again because I actually have...energy! I haven't noticed any of the random heavy feelings in my limbs and I'm having less muscle pain in general. It's too early to see a change in my hair and nail thickness, but the other signs all look good that I'll "ace" my blood test and be able to stay on this dose. I'll be getting that done soon and I'll post about it when I get the results. It's not just my thyroid that feels right again. Ducking under the 200lb bar is like magic for me. I feel more like myself in so many ways. More of my clothes fit now. My face is less puffy. I'm back to bouncing around (sometimes literally) like a hyperactive little kid again. I need less sleep. I feel....GOOD!! So the specifics... I weighed in yesterday at 198lbs. That means I'm down 29lbs since March 29th. I was hoping for a round 30 for the double-whammy of two milestones at once, but it didn't happen. I don't care, I'll take it! ....and an awful selfie (I need to get my bangs trimmed....and wear makeup) just because. Gotta try to recruit someone to take a photo of me for one of these posts sometime. 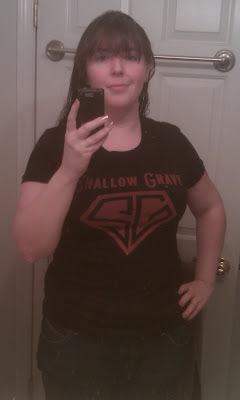 The shirt's still a little small, but I was happy just to fit into it! Dunno if anyone will recognize it, but I got ALL of them! I'm geeking out so much over most of these. There are still a few that haven't gotten here yet. Anyway....yay!! It's great to be "back"! Congrats !!! You should be super proud of yourself ! Thanks! :) I'm pretty thrilled about it!